Manipulate visual images in realtime with intuitive fingertip control. For any artist who produces performances that bring together images and sound. The KAOSS PAD control any type of effect in realtime with the touch of a finger. And now, the new KAOSS PAD entrancer gives you similar control over video effects and transitions. Images are now an indispensable part of dance music, and the entrancer lets you control them in realtime just as if you were performing them. This revolutionary audio/video effect processor opens up a new world of image and sound by allowing you to easily manipulate video at any type of performance . By moving your finger vertically and horizontally over the X/Y pad or by tapping it, you can control different parameters simultaneously, just as if you were performing video. A wide range of effects can now be performed quickly and intuitively, opening new possibilities for video and musical expression. In addition to its potential as a new VJ device, the KAOSS PAD entrancers sophisticated flexibility lets it work with other types of video systems. It can also be used to add an element of realtime control to the video equipment system you are already using, or you can use it to add effects to a DVD or other image source for your own enjoyment. 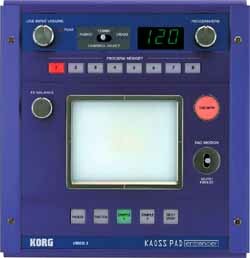 It also includes all the audio effects of the KAOSS PAD KP2. You can choose from 100 different video effect programs and combinations that modify the image. From basic effects such as nega-posi, fade, mono color, wipe, color change, freeze, flip left/right, flip up/down, rotate, and expand/shrink, all the way to more sophisticated effects such as noise, stretch, split-screen, invert image components, sand storm, monochrome, delay, strobe, mirroring, and emboss (and even unusual effects like spinning while shrinking) you can control a range of visual effects. Effect programs can be selected easily by turning a knob, and eight of the audio, video, and combination effects can be directly accessed in the program memory buttons. Theres also a Hold switch that lets you hold the state of the effect produced by the current position of your finger on the touch pad. This lets you easily control everything from simple effects to radical changes produced by the simultaneous application of multiple effects. There are 100 combinations that combine these effect programs with audio effect programs, controlling them simultaneously. The entrancer is packed with many audio effects; filters, distortion, spatial-type effects such as delay and reverb, and effects like flanger, phaser, and pan that add movement to the sound. Many analog synthesizer and ambience sounds are also included, making the KAOSS PAD entrancer a great tool not just for the VJ, but also for DJ work, remixes or music production. Twenty types of BPM effect can be synchronized to the tempo of your music to control delay time or the pan, phaser, or flanger LFO. Of these, eight can synchronize a rhythm pattern or synth bass to the BPM, and play it from the touch pad. You can set the BPM manually, use Auto BPM to detect it from an input source, use the Tap Tempo function to set the BPM by pressing the Tap key, or control BPM from incoming MIDI Clock messages. Using Sample/Play effects, you can direct-sample an image and a phrase and use the touch pad to apply effects such as time-stretch, reverse, scratch and play it back. There is a six-second maximum for visual sampling and for each of the two sample keys, you can record one still image and a six-second audio phrase. You can also direct-sample the image and visual phrase being output (for each of the two sample keys, you can record one still image and a six-second audio phrase), and play it back. Of course you are also free to apply effects to the sampled still image. The Pad Motion function lets you record the movement of your finger on the X/Y Pad, allowing you to easily reproduce complex movements to instantly create highly-original image or sound effects. Mute/Freeze lets you freeze the output video, and play the still images registered in the SAMPLE 1 and SAMPLE 2 keys, magnify or invert them, or cut the input sound to leave only the reverb or delay effect sound. You can also use this to rapidly switch Mute on/off in time with the rhythm for a tranceformer technique used by DJs. You can show audio waveform images that appear like an oscilloscope and other high-tech instruments. With the KAOSS PAD entrancer you can truly visualize your sound. You can also have the sound affect visuals. The KAOSS PAD entrancer provides a wide range of inputs and outputs for easy connection. Video and S-video input jacks let you directly connect video, DVD, or camcorder devices. In club situations where you need to switch images in succession, you can use VJ software running on your PC together with web cams. MIDI connectors let you use the entrancer to control the sounds or effects of an external keyboard, sampler or effect processor, and even sequence and replay your movements from a MIDI sequencer. And using the entrancer in conjunction with external equipment will open an infinite range of possibilities for controlling image and sound effects. Weight: 2.1 kg / 4.63 Ibs.